Toksokaroz (toxocariasis) – is helminthiasis of the nematosis group, characterized by fever, bronchitis, pneumonia, hepatosplenomegaly, and eosinophilia. A larval toxocariasis is registered in many countries worldwide. 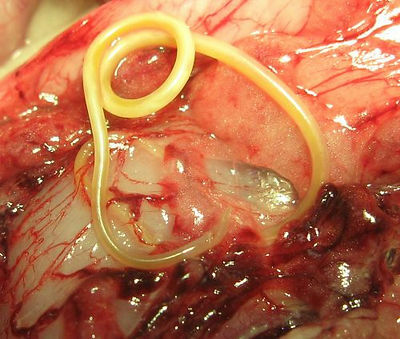 In humans are distinguished larval (visceral, eye) and imaginal (intestinal) T. People become infected by ingestion the eggs of toxocariasis with food and water contaminated with feces of dogs, as well as by contact with infested dogs; hatched larvae migrate from the intestine through the intestinal wall and enter the blood vessels in various organs and tissues, which are encapsulated and maintaining long biological activity, cause larval form of the disease. 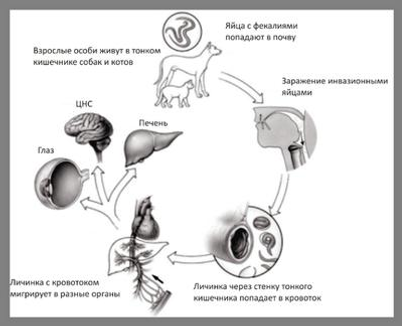 The Larvae toxocariasis of cats after migration again fall into the intestine in the mature stage of development (of adults) and cause the imaginal form of the disease. More commonly suffer the children between the ages of 1 and 4 years. The disease occurs with pronounced allergy symptoms: itchy rash, fever, hepatosplenomegaly, bronchopneumonia with painful bouts of coughing and choking, puffy face, form in various organs of specific granules containing larvae toxocariasis. There are toxocariasis ophthalmitis with lesions of the posterior segment of the eye (chorioretinitis), keratitis. 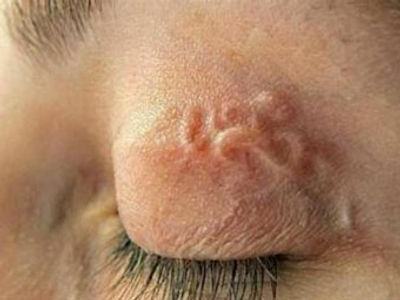 If eye toxocariasis then possible irreversible eye damage, including abscess or migrating larvae in the vitreous and keratitis, up to the loss of vision. The duration of illness is several months to several years. Imaginal toxocariasis is rare. Clinically is manifested by nausea, abdominal pain, profuse salivation, loss of appetite, dizziness. Toxocariasis - a widespread parasitic disease of man. It is more common among rural residents and children under 14 years. Forecast generally favorable, however, with severe lesions of possible death, and, at best, can lead to disability. The clinic "YUDJINA" is conducting non-surgical medical treatment of various parasitic diseases, including toxocariasis, hydatidosis and alveococcosis. Treatment is carried out the author's original drug developed doctor Lee Evgeny Hynchanovich. The unique author's technique and proprietary products allow Evgeny there be a guaranteed successful treatment.